I just have to say that the WordPress blogging platform is magnificent. This system just keeps getting better over time. In the series of upcoming articles, I’m going to use various types of data collected by WordPress over the past three years. This daily data will provide insights that will allow me to tell stories about the results of 3danim8’s Blogging Experiment. In the first few articles, I use Alteryx combined with Tableau to tell visual stories based on the WordPress data. The goal is to create visualizations that explain the observational data. Initially, I am not going to be focused on explaining quantitative results, as I want to use Tableau in the purest way possible. I want Tableau to tell the stories I have uncovered through great visualizations and I want Alteryx to crush the data as it is always so good at doing. In the latter part of this series, things will get quite technical and the usage of Alteryx will increase dramatically. This phase will involve using various forms of regression, predictive analytics, and statistical methods to uncover the successes and failures of the blogging experiment. There is still a lot of data collection and prep work for me to do before conducting those analyses. Let the fun begin! Yeah, I’m going to break on through to the other side (as Jim Morrison is singing in my headphones right now!). After 1,050 days of blogging and 6 months of rest and recovery, I have finally begun the qualitative and quantitative assessment of the 3danim8’s scientific blogging experiment. There is so much for me to share, I’ve decided to write the results in a series of articles that focus on only one topic at a time. I don’t know how long it will take me to finish this series. I guarantee you that some of the results will surprise you. For over 900 days between May 31, 2013 and November 11, 2015, I conducted a scientific experiment. This experiment was disguised as a technical blog. You can explore all the 160+ articles written as part of this experiment, right here on this blog. The blog articles focused on techniques, applications, and data-science problem-solving ideas using Tableau and Alteryx. I also wrote about a few other minor topics for the fun of it, but the focus was on using these two FANTASTIC software tools to do great things with data. Now the time has come for me to learn all that I can from that blogging experiment. When you write your first blog article, nobody knows who you are or what you are doing. You write the article, publish it, and then wonder what will happen. Will someone call you or will someone say something about you in a social media forum? Well, based on my experience, not much will happen at all. You will find yourself writing about the things you love to do, with the hope that someone else out there will read what you wrote. As time passes, little changes begin to occur. You notice that people start reading what you wrote. You notice that your work begins spreading, geographically-speaking. The geographical spread of a blog is what this article will show. I have a couple of Tableau animations to show how this happened on 3danim8’s blog. I also have a few figures to show. Well, that’s all I have to say for now. Please watch the videos and see what happened over the past 3 years. I was very surprised by the results. In this first animation, the world-wide spread of the blog readership is visualized. This type of map is great for showing which countries have seen the blog but it isn’t so great for comprehending the timing and magnitude of the readership. Figure 1 is the final count of blog views on April 20, 2016. A total of 178 countries have viewed the blog but central Africa remains untouched. Figure 1 – The cumulative 3danim8 blog hits as of April 20, 2016. I haven’t managed to reach central and parts of coastal Africa but 178 total countries have seen the blog! In the second animation, the timing and magnitude of the geographical spread is nicely portrayed. About 10 percent of the countries that have viewed the 3danim8’s blog have had at least 750 hits. Figure 2 shows the distribution of those countries. 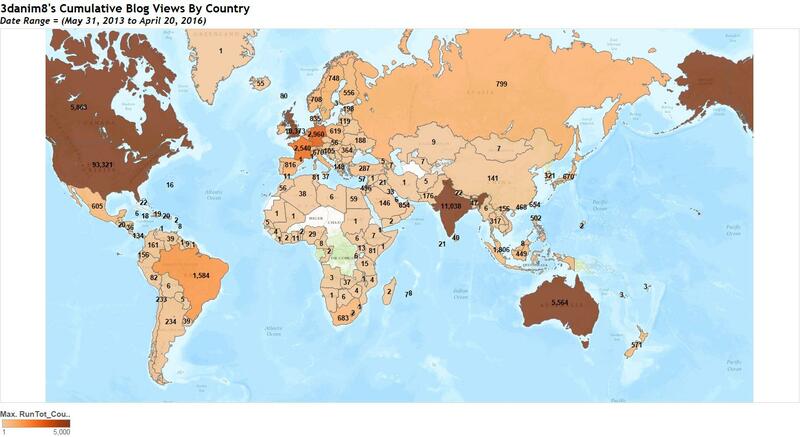 Figure 2 – Countries with at least 750 blog article views. Figure 3 is an interesting type of visual that I will be using throughout this series. This figure is used to demonstrate the chronological order in which countries discovered 3danim8’s Blog. The difference between the first vertical dashed line shown at 5/31/13 and the first brown daily tick mark for any given country indicates how long it took for the blog to be discovered in that country. At the the end of year 1, 63% of the 178 countries had discovered the blog. 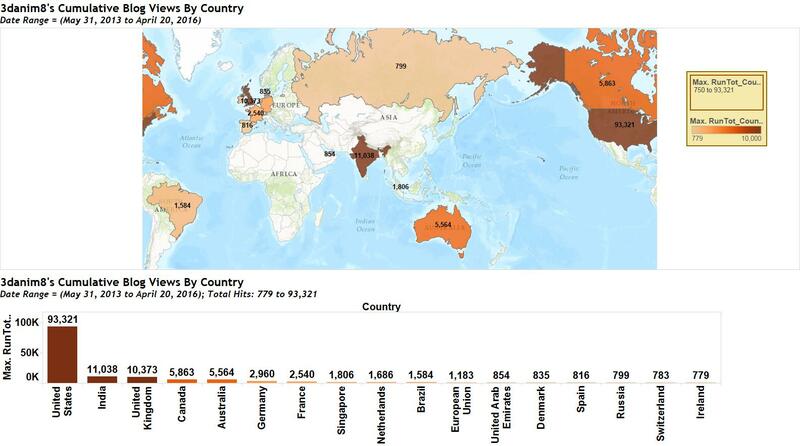 At the the end of year 2, 90% of the 178 countries had discovered the blog. The other fascinating thing about Figure 3 is what I call “continuity“. This type of figure is great for understanding how continuous the readership is in any country. Although it might take a while for a blog to reach any given country, once it is there, it is interesting to see how much traction can be achieved in that locale. As can be seen in this figure, there can be periods of intense readership (e.g., United Arab Emirates at the end of year 2) or periods of sporadic activity. Figure 3 – The timing of when countries discovered 3danim8’s Blog. Here is a video to show you how to collect the daily data for your blog. Notice that there are multiple categories of data that you can download including but not limited to posts and pages, countries, referrers, videos, etc. Collecting this data is a labor of love but the things you learn about your blog make it well worth doing. In my case, I have to download 1,050 individual files for any metric I am interested in processing. This means I have 3 mouse clicks per file, or over 3,150 clicks. This takes a few hours to accomplish per metric. Alteryx is a modern-day masterpiece of software design, functionality, and capability. In my estimation, it is simply the best program in existence for creating data sets that will be used for visual and quantitative analysis. With each passing month, I have grown to appreciate Alteryx is so many ways that I’ll have to write a separate article to explain my feelings on this topic. Figure 4 shows the workflow that produced the data used to create these visualizations. In just a few minutes of time, we turned thousands of daily data files into a coherent data source that could be used to tell a story. Alteryx is simply a magnificent software tool. 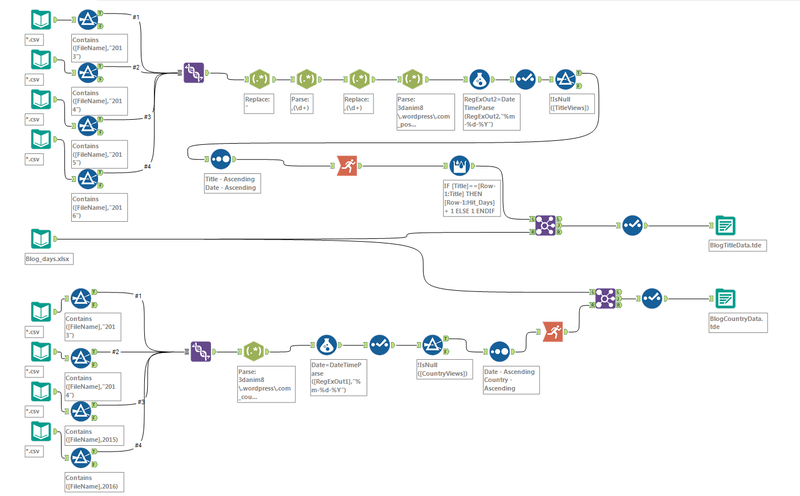 Figure 4 – The Alteryx workflow developed to process daily blog posts and pages data and the country data. You might have noticed that I said “we” in the last paragraph. Well, the “we” in this context is Nathaniel Worrell, my newest co-worker at GM. Nate will be helping me through the rest of this series as a part of his on-the-job training. Nate is a recent college graduate that had no experience with either Alteryx or regular expressions prior to two weeks ago. After a bit of directed Alteryx training, he wrote the workflow shown in Figure 2 in a few hours time. Nate also produced the second animation, and this was done within his first 2 months of using Tableau. These examples illustrate how a little on-the-job training can help co-workers to use these tools in very productive ways. Athough this experimental analysis is focused on 3danim8’s Blog, the underlying momentum for this geographical expansion resides in two companies: Tableau and Alteryx. The only reason this particular blog achieved this type of rapid geographical expansion is because of the marvelous achievements of Tableau and Alteryx. If I had chosen to write about woodworking, weightlifting, cycling, or some other topic, the experimental results would have been much different. Therefore, I just want to thank the Tableau and Alteryx companies for all of their innovation, creativity, and tireless work that has lead to this study. I simply was able to take a magic carpet ride around the world due to Tableau and Alteryx. Finally, without WordPress, I don’t think it would have been possible for me to have conducted this experiment in the way that I did and to process these results. By using the analytical data collected by WordPress, I have been able to see some amazing things that occurred during my experiment. Many thanks go out to the WordPress staff for their continued work on making this blogging platform the best that there is! In Part 2 of this series, we are going to use the daily data about the posts and pages to learn some really cool blog behaviors. I certainly could not have predicted what will be shown before I conducted the experiment.